Receive the Weekly Reflection in your Email. This Sunday in San Diego, you would probably find only one congregation in the entire city reading the story of the Parable of the Tenants, from Luke 20. The rest of the ecumenical world have moved on to a different schedule of readings. We are using the Book of Common Prayer. Anyway……..You probably will recognize it when you hear it, this teaching of Jesus by allegorical parable, where the absent owner of a vineyard sends several delegations of servants to collect the rent and portion of the harvest, all of whom are beaten up and sent away by the tenant farmers. When the owners’ son was sent, they decided to kill him, too, and claim the inheritance. No responding mercy in this story, though, like last week. 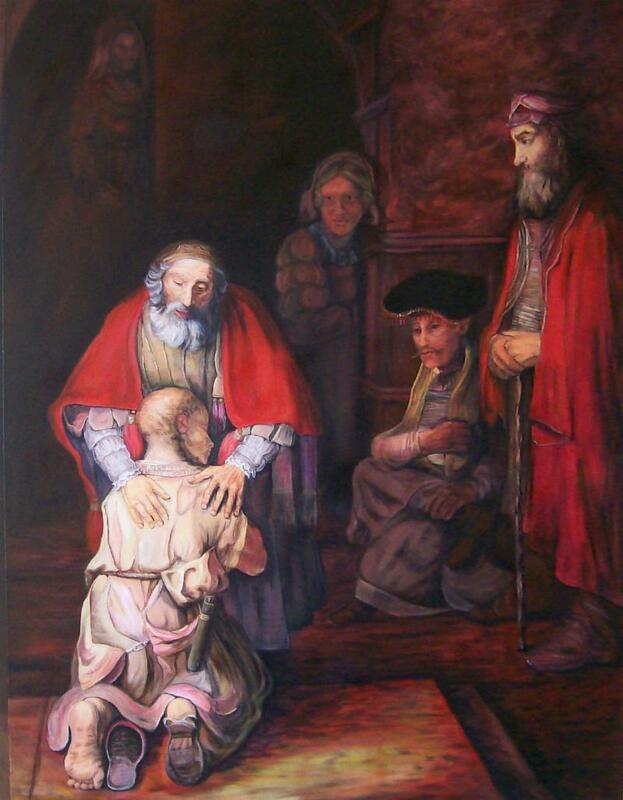 Last week in the story of the Prodigal Son, the Forgiving Father recognizes repentance, and Mercy is applied. 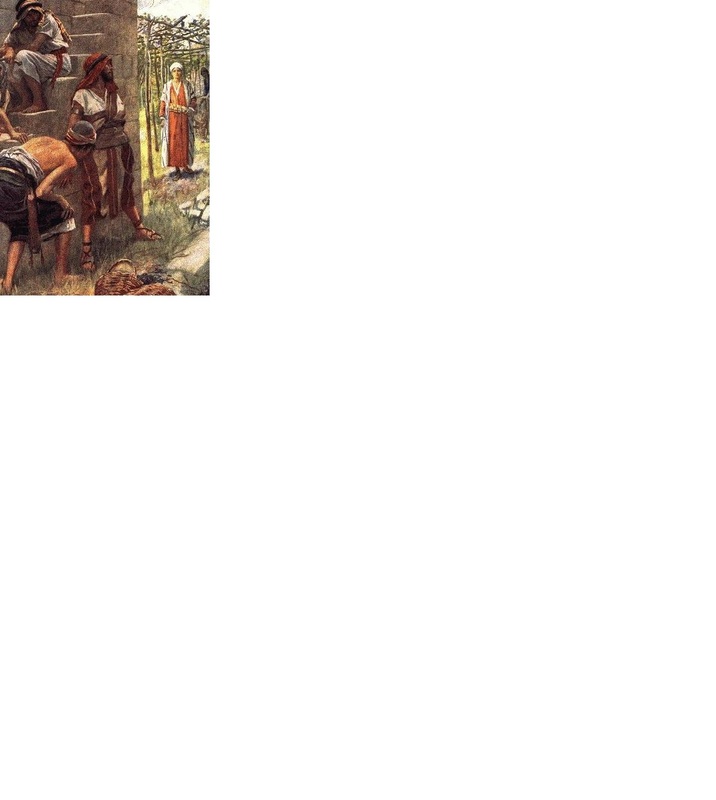 Here there is not one hint of repentance, and as Jesus tells the parable, the owner has all the tenant farmers killed. One little phrase, though, somewhat unexpected to those whom Jesus is telling the parable. "What then will the owner of the vineyard do to them? He will come and kill those tenants and give the vineyard to others." When the people heard this, they said, "May this never be!" They do understand the judgement is justified for the horrible crime. They get that. Rather, they are responding (“May this never be!”) to the unexpected: “and give the vineyard to others.” The crowd listening understands this is a parable about the People of God, and although still scratching their heads about Jesus as the Messiah (and thus the son of the vineyard owner!) they cannot wrap their heads around how God would give up the Promised Kingdom to some OTHER PEOPLE!
" 'The stone the builders rejected has become the capstone'? but he on whom it falls will be crushed." This is a very powerful part of the story, of the purpose, the mission, of the Messiah. He has come to provide salvation for a People lost in the darkness of their lives attempting but failing to fulfill the Law of Moses, and the Ten Commandments. He has also come to save those who are lost in the darkness of the World. So Jesus becomes the capstone, or the CORNERstone, of a new building. This building is not only the People of the Promise to Abraham any more. It is the new building, made up of ALL those who will believe in him as the Son of God, the Son of the Father who is now redefining the Kingdom of God on earth. There’s an old adage in the rebuilding and remodeling of homes: keep at least one wall, and you won’t have to apply for a new building permit. You may have experienced something of the same when your life has fallen apart, but you step up to start something new: same person, new life. And now you find yourself and your new life flourishing. These kinds of rebuilds usually come from disaster and tragedy. But for Jesus the Son of God, for God the Father, and God the Holy Spirit, the use of the Messiah to be killed but to become alive and the new cornerstone was in fact the plan. I’m sure you get that point that the Kingdom of God will eventually mean the destruction of all of God’s enemies, including those who refuse to believe in His Son. But here is another. If you've lived very long and are blessed with just a bit of self-perception, then you know how possible it is to resist God’s desire to be in your life, to rebel against God. You can love God on the one hand, but stand adamantly against his will on the other. Your reasoning and justification can rise to heights of presumption and twisted confusion. Thus, you end up fooling yourself (mostly) into believing your own rationale. But in the end you are a rebel, and more -- a rebellious unbeliever -- who loves God, or purports to. Crazy? Yes. But possible. Quite possible. We begin looking at this passage by talking about our own tendency to resist God and his will. We want our own way, prefer our own way, and resent it when we can't get it. Too often there are issues we war with God about -- an untimely death, a financial reversal, a loss we can't seem to recover from. Sometimes we openly voice our bitterness in prayer, and sometimes speak it to family members and other Christians. If we allow ourselves to stumble over Christ's will, then we call upon ourselves the awesome punishment of being crushed to powder by the Stone. Yes. Because the Capstone, even having been rejected, can be the New Cornerstone of our WELCOME of Jesus Christ into our lives; to believe and respect the Owner’s Son. This is also part of God’s desire for us. Father, forgive me for my resistance and rebellion. Help me to accept you and your direction as from your hand instead of resisting you at each step. 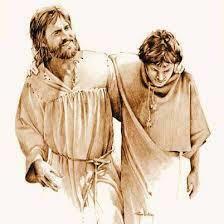 Help me always to follow your Son, Jesus. Amen. One of the most famous parables of Jesus is going to be read at the Sunday services at All Saints’ Parish this week, March 31, 2019. Of course, ALL of Jesus’ parables are very well known. Folks who haven’t gone to Church might not know about Jesus, who he is, what he did, why he is important, how come people say he has some good news. But more than likely they have heard in daily conversation the retelling of one of the parables, even if only a punch line, or the sharing of a title, like, “You know, like that guy who buried the money he got instead of investing it”, referring to the parable of the Talents. Sunday’s parable is about the younger son who asked for his share of his father’s property and business, went away, squandered it on gambling, exorbitant living, etc., and then found himself BROKE. Now what? With the knowledge that the hired servants at his home ranch get better food and treatment by his father, and repentant of his arrogant and wasteful behavior he decides to go crawling back to his father at the homestead, show his regret and repentance, and just beg for a job. In the parable that Jesus shares, the young man does go back and falls at his father’s feet - the father who has come out to greet him because he is so relieved to see him and know that he is alive. The father does not receive his younger son’s proposal. Rather, mercifully, he raises him up off the ground, and proclaims him as “son.” And the party feast is on . And, famously, that’s where Jesus ends the parable. 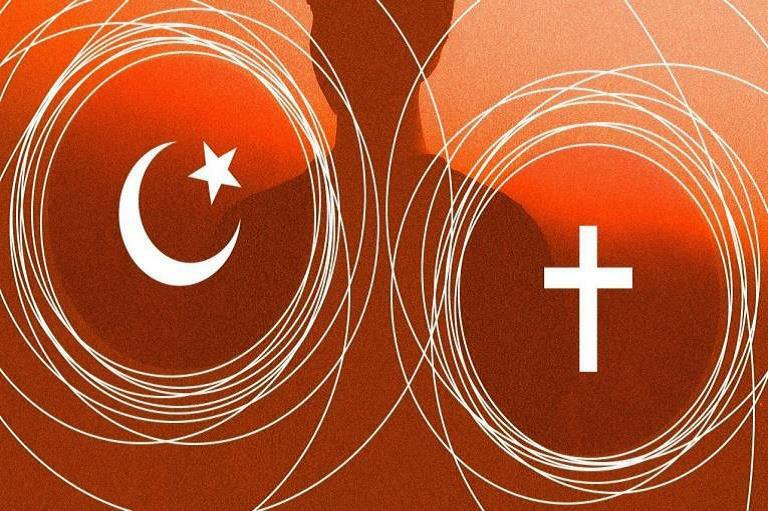 When you compare Jesus' use of the parable as a tool for teaching with other forms of storytelling with morals, we find that the parables are uniquely very rich in meaning and symbolism throughout the parable. Every one part and all parts together of the parable are meant to be used for the purpose of teaching about something, in this case the Kingdom of God. As well, a parable in all its richness can speak to not only a whole people, but also each individual who hears it. And there are times when Jesus uses his parables to teach and challenge a very specific group of people who are listening in; at the end of the parable those people usually realize that Jesus is talking about them and they get offended. There is so much here. In this case the parable has three sections and two of those sections are in fact two endings. But these are not ALTERNATE endings; you don’t get to pick one or the other. What we have then is a story of a Young Man who blows it with his family and comes to realize bluntly how far he's fallen, and then makes the attempt to return, and in the return he finds two different responses. One of those responses is immediate in relationship, and the other does not let you know where he stands.. When I drive to my home and back on the freeway, I usually take a break at a Pilot truck stop. Today that name inspires me to think of Jesus as a teaching “pilot” leading us from one point to the next, presuming the former, because each point is important at which to arrive. The second ending Jesus teaches is how each of us usually respond to those who have hurt us in some way. The older brother represents people who are part of the family and are supposed to know about Mercy but they don't offer it. Ouch. There does not seem to be a demand in the parable for all of us human beings to be forced to be merciful to each other. Parables are truths about “what is” even in a story form. What Jesus hopes, I believe, in teaching this parable is that all of us human beings are selfishly inclined to withhold Mercy. And the purpose of that is we will (like the younger brother come to that awareness!) come to realize that we do want to look and act like the father than our selfish human behavior, and begin to share Mercy with each other. If we don’t, we will find ourselves in an ending to our own story that does not have an ending we want to see. Not a threat. Simply a matter of righteous fact. As with the father's response in the parable it is still important to see that the younger son was repentant. So, when someone comes to you and is repentant for their behavior I think Jesus is teaching, be merciful as your father in heaven is merciful. Join us and Church and hear more of the mercies of God. What a blessing this Sunday is in Lent with two very, very familiar stories from the bible. One is the story of the Burning Bush, or perhaps we could call it the story of “the Bush that Didn’t Burn Up Even as it Looked like it should have”. Yes, a miracle. And, yes, “The Burning Bush” as a title is simpler. This was a real-time miracle that Moses not only observed from afar, but also right up close to it (so, you can’t say it was simply a mirage in the wilderness heat). The other story is of the Barren Fig Tree. Or perhaps, the story of “the fruitless fig tree that was given an extension.” It was a parable that Jesus told. A parable is a teaching tool to get a point across, a moral and/or Truth about the Kingdom of God. Let me share it with you. You’ll know the parable as you read it. God gives us all an extension! Here are some thoughts on that theme by the Jesuit, Fr. Donal Neary. “Life is often a matter of falling and getting up. Lent – give up something and start again. Rows in a marriage or family and we try again. Fig tree was barren, but got another chance. Give it one more chance. God never points the finger. Always an extension! Another chance! In our lives we feel judged often by God and condemned. This is never the case. Allow the flow of love to enter those dark sides of ourselves. You could imagine people pointing the finger at the tree. No fruit again. Like we do often. Cast the first stone, see the speck in the other’s eye and not the beam in our own. We are good finger pointers. Isn’t that the Truth, that we are supported always by the love of God. Of course, there is a day coming when the extensions end their course! And since we do not know when that day will come, then NOW is the Day to file for that extension, so to speak! Let’s add to Fr. Neary’s reflection by adding in that story of the Burning Bush (it comes from the Book of Exodus, Chapter 3). Don’t we all need to know that there is a tree that never burns! And the voice and the burning itself tell us that such a tree exists, and that is God. His love spreads in his care for us. The God of Moses is the one who always is, and the one whose very heart is compassion, another word for mercy. That mercy tells us that there is in fact with God “the other chance” – a need we all have and will always exist in life. For instance, we know the struggles of people in addiction who needed “the other chance” and believed in themselves and in God. Beyond our own strengths as people in need, people who have turned away from a life of crime will have had people who gave them another chance. Teachers know the value of believing again in a student, whether that first-grader child, or the struggling 2nd year college student. We are people always given another chance by God to move on in greater faith and strength and in repentance when necessary, and WE are his people who – like Henri Nouwen’s “wounded healers” -- WE are the people of God who are called to try to give another chance to others. The Burning Bush will eventually stop burning, but it will miraculously never be consumed. The fig tree with the help of the compassion of others, and an agreeable owner, will have the chance to still be a bearer of fruit. Lord, help the reader of this reflection know and believe that you never give up on them, or anyone. May I be the same! The Gospel reading for this coming Sunday, March 17, which (besides being the traditional St Patrick’s day, but Sundays always take precedence over any other feast day) is the Second Sunday in Lent. As you will hear in the very first words, Jesus is on his way to Jerusalem. It is as ominous as it sounds. The second half of the reading, Luke 13:31-35 begins with a warning from the Pharisees for Jesus about Herod’s plan to kill him, but it becomes, first, a reflection on the nature of Jesus’ life and mission; the ultimate destination of his mission is in fact the reason he is heading for Jerusalem, when he will be put to death. And, second, it becomes a reflection on the tragic role played by Jerusalem in the life of Jesus and other prophets. “At that very hour some Pharisees came, and said to him, "Get away from here, for Herod wants to kill you. "”, whether there was some impurity in their motives! And whether or not their warning is either sincere or representative of a real threat. In any case, Jesus takes the time to answer their warning. Whatever the purposes of the Pharisees and Herod, Jesus uses the threat to make clear the nature of his upcoming death as a part of his mission. Jesus is going to die, but it will have nothing to do with the threat of Herod. Rather, his death is the completion of his present ministry. He characterizes this ministry as “casting out demons and performing cures.” This fits so well with the victory of Jesus over Satan in the wilderness, and how much we need Jesus to save us from those same temptations into sin, and our separation from God. In that way, the passage invites Christians today to reflect on the meaning of Jesus’ life and death and on the role we play in the continuing mission of Jesus. But it also points to something we need to make use of during this Lent season, for our penitence and self-examination. You hear the words about “what is to come”, and about the true Prophets who cannot “perish” outside of Jerusalem. Jesus has been journeying to Jerusalem for a few chapters now, and it is a journey that will last 6 more chapters in Luke’s Gospel. Jesus’ mention of his death there leads him to reflect on the tragedy that Jerusalem had been in Israel’s past and will be in Jesus’ future, even though its role is a necessary one. There is a major prophetic ministry in Jesus for himself and for the world, which is not only necessary but extremely appropriate in our own daily lives, you see. And all this talk about prophets can raise a very important question for us as we make this journey with Jesus to his crucifixion. As we walk with him, it’s not just his cross for himself that we must consider. We are also, in Lent, preparing ourselves to experience Jesus’ cross, seeing to it that we bear our own. As we hear this passage let’s consider whether our lives lead appropriately to that cross. Can we make sense of our own personal, seen-by-God lives as a part of how God wants to both establish and build up His kingdom in our world? If we lived in China right now how frightened would we be to leave that mission due to the threats of their earthly rulers; their Herods? And believe me, the gift of prophesy is given so that we CAN IN FACT be recipients of such insight. Why? Because we need God’s Truth to set us free. So, most importantly for this reading, here is the prophesy application to US, as we are the living Jerusalems (because we are living temples of the Holy Spirit) where the Word of God is to make its throne: if Jesus were to speak prophetically to us, what would his message be? How have we played the tragic role of Jerusalem? On the other hand, how have we recognized God’s messages and kingdom, and how can we continue to do so? May Jesus’ death be in you, rather than apart from you. And may his resurrection from death and the grave, be also the center of your own death and life in Christ. The Bible is filled with promises from God. 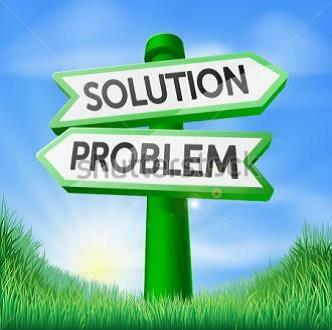 There is only One God, so it is important to absorb into your thinking and praying that Guidance from God that we really like and that which we DON’T really like are not necessarily two opposing forces. In the One God there is not a dark side and a light side. God DID create darkness and light, but as one complete cycle. What God tells us in His promises is that he wants the BEST for us, AND he will act for the establishment of His kingdom. And, actually, to turn that around, the way God has chosen to build up His kingdom in heaven and on earth is to guide us into maturity. And the development of our maturity will most likely include God leading us into places and adventures that we really like doing, and places and adventures that really test us to our core. And, of course, in the testing is the refining, and thus strengthening. There's a song that says, “Some of God's greatest gifts are unanswered prayers.” That's the idea. We are now into the season of Lent. Lent is an ancient period of time leading into the celebration of the Resurrection of Jesus. This year Easter is on Sunday, April 21. Although Lent has been shorter (as when the first priest or bishop decided to have a time of vigilant prayer probably 1900 or 2000 years ago), and though we know it’s been longer (as the tradition took on a life of its own), it settled down to 40 days of praying, fasting, and instruction. The number 40 is not coincidental. It appears in many places in the story of God and His People in the Bible. The story that makes it so easy to continue a strong tradition of 40 days of fasting and praying is the period of time that Jesus spent in the wilderness following His baptism by John the baptizer. For all the outpouring of love and mercy, the self-sacrifice of the suffering Servant, which can fill us with joy and completion as disciples of Christ, and all led by God, how is it that we can understand the Spirit of this same God driving Jesus into harm’s way, a phrase we use in military terms. You know, it’s hard enough to fast for 40 days, much less have to end those days with a major battle of temptation from the devil. I'm not going to try to explain this for you in this reflection. What I want to encourage you to do, though, is understand this is the same, One God who has poured out His Spirit at Jesus’ baptism, and has now driven Jesus out to be tempted by Satan. Even more so, as we consider that Jesus did not sin, and this is not a matter of enforced punishment or payment. But for us, as we have sinned, if that is the case for the sinless Jesus, which I believe it is, then we must consider that this same God, who desires not the death of a sinner, but rather that they turn from their ways and live”, may do the same blessing and “driving” in the lives of sinners he wants back. 2) Make a list to keep. 3) Then think about your life and how GOD has driven you into situations that demanded every ounce of your faith, your perseverance, your devotion to serve the Lord, as dark and difficult as they may have been, and whether you came through it successfully (as Jesus did), or you did not. 4) Jot down God's assistance during those times. Who was there? What did you learn about yourself? How did you grow in the maturity of your faith? What “circumstances” assisted you? Or, what weaknesses did you discover? What was missing? How did you come back to an assurance of faith if you didn't “make it” through those times? 5) Keep your notes and thoughts for another time, which then might be helpful. Finally, just remember this, because it is also very true: not every dark place in which we find ourselves is of God's making! And not everything we might count as abundance and blessing is of God, either. Lent is a season to help us discern the differences, and then grow into further maturity in Christ. Key: Always, always keep your eyes upon Jesus. It’s just a word, “transfigured.” But with so much power in it already in our contemporary society. Just the first syllable alone, “trans” gets people’s minds moving in the direction of thinking you are going to say something else. We are brought to mind of a major feast day celebrating a moment in the life of Jesus Christ in the Gospel lesson for Sunday, which is the Last Sunday before the season of Lent begins. The word transfigured is not in the telling of the story by St Luke, but the entire story has been labeled for a millennium as, “The Transfiguration of Jesus on the Mountain.” There is MUCH to the story, and I invite you to attend one of our Sunday services so you can hear it, and the selected accompanying Bible readings which very much enhance the Gospel reading. We have a Mass (Holy Communion) at 8 am and one at 10:30 am (with lots of music). The main focus of the story is the description of Jesus being “transfigured.” If we’re talking about Jesus, then I can’t say “Its ‘just’ a word.” On top of that, there is a larger meaning of the story for us who weren’t there, that being what it means to be “enveloped in the cloud of God” (that’s what happened up there on the mount, with Jesus and the three disciples he took with him), and come out shining with God’s glory to the World around us. Are we transfigured, too? However, translators have always chosen to translate the word in relation to Jesus’ mountain top experience as "transfigured" instead of the word "transformed" to emphasize that this is still Jesus, and still identifiable as Jesus, that is, not “morphed” into something or someone else, like the cartoon and animated Transformers (“More than meets the eye!!”). Back to Luke who simply describes, he says, “the appearance of his face changed, and his clothes became dazzling white.” Whatever the case, Peter, James, and John were not confused. They knew it was Jesus. He looked different, but he was clearly him. He was "transfigured," not "transformed" into something else. Here’s the reflection on these things of transfiguration and transformation. I can think of times when my own face has been transfigured from sadness to joy, and from depression to hope. You can probably think of something of the same, where you have not been “changed” from one thing into another, because it is still YOU. Your face may have been transfigured from muscles forming a frown or “downcast” expression, to the muscles forming a smile, lifted eyebrows, a tilt of the head, and so on. Someone else looking at you and witnessing this might say to you “Wow, You’ve just changed!” And what really has changed has been not your facial muscles – they are the same muscles – but now your face has been transfigured by your response to something else. Like Good News. Like a warm and empathetic word. Like realizing what was dead might still be alive. The son or daughter or parent or friend that had wandered off or even abducted has been found alive. The other term, transformation, speaks to a much deeper reality, where what was once, has now been completely changed into something else. Jesus was transfigured, not transformed. Jesus wasn't really changed in any way. He was no more and no less divine because they beheld him in glory; and he was no more and no less human, either. 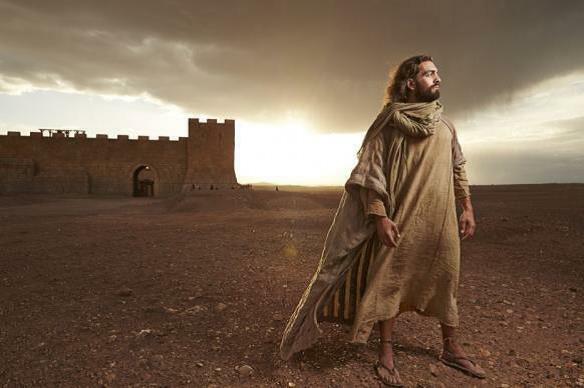 We might say they saw “the real Jesus,” in seeing him as he could be seen in the Kingdom; but he was still the same Jesus they’d walked with up the mountain. He wasn’t somehow a different sort of being. And, you see, Jesus didn’t need to be transformed because he didn’t need to change! But for their sake He was transfigured so they could see and believe even more that Jesus was glorified. Having a voice come from the cloud was icing on the cake (don’t want to give all of the story away, in case you haven’t heard it! You can read it, though, in Luke, chapter 9). So what’s the bigger picture for us non-divines? Well, we do hear from time to time about the "transformative power of the Gospel," and that's because our sinful nature must actually be changed in order for us to be received as righteous before God. 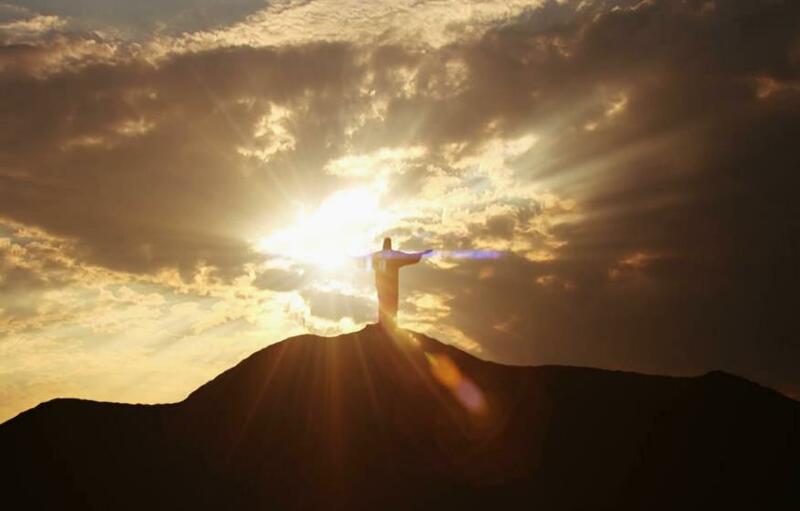 Yes, we need to be changed from glory to glory, but once that has been accomplished by Christ, through faith in Him and by His Grace toward us, then we are due for moments of transfiguration as the light of Christ also shines through us, fully reflecting the glory of God. I say this because we don’t stay on the mountaintop in our own moments of being transfigured in some way, or even in the glory of God with His light shining off our faces and our deeds. Jesus had to come down the mountain, and the apostles with him. And when they did, they found a crowd waiting. 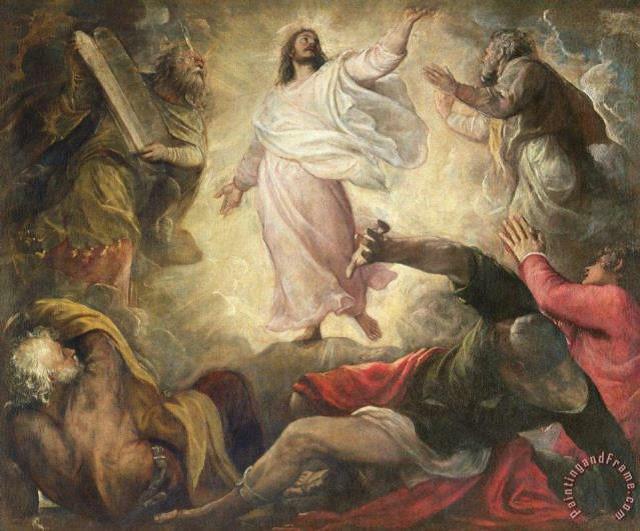 Ultimately, you see, Jesus’ transfiguration, and ours, is to be carried on in our assistance and ministry to others. How? Well, as Paul says, we are given God’s grace for being transfigured just for the purpose of helping others be transfigured themselves. Even if as simple as saying to someone who is depressed, that you experienced transfiguration into hope from your own depression, you have just allowed that person to receive an invitation to also be transfigured in hope. We are called to reflect the presence of Christ within us. Jesus, who wants to shine to the world, wants to shine right through you. Come to Jesus and be transformed and be transfigured. The word ‘karma’ has been in everyday West coast vocab for 50 years, and then spread from there all the way back to Hindu India from whence it came. I say Hindu India, because from a religious perspective there are many Indias, including Christian India. That’s an illustration to show that there are differences between the concept of karma and the Christian understanding of what is taught in Luke chapter 6, as we will hear on Sunday (2/24/2019). It's a good time, then, to talk about the difference, because Karma and what it sounds like in the Bible are not the same. Karma is the belief that good and bad experiences in this life are the sum result of deeds done in both the current, and previous (!) lives. Karma is supposed to help us make sense of why we may be going through certain situations. It also gives us rationalization for the cycles of birth and death. Essentially, what a person reaps in this life can be a consequence of what they sowed in their previous lives. What a person sows now, they will reap in a future life. And karma can accumulate, giving you a chance to balance out positive or negative consequences. On the Jesus side of things (which Christians believe is nothing but the Truth) he said, "For the measure you give is the measure with which you shall receive." The Gospel for Sunday is full of such statements. And in another place, such as the Letter to the Galatians, St. Paul echoed Jesus, saying, "What you sow, so shall you reap." Measured giving and receiving, and sowing and reaping in a Christian’s life of faith relates to the eternal implications that faith has on the Kingdom of God. It can thus be applied both to the Christian’s life on earth as well as in eternity. However, it’s different from Karma in this way: faith in Jesus Christ is a major component. Without the knowledge of Jesus Christ, and the discernment of the Holy Spirit, I believe we could easily mistake one for the other. However, both of these principles have very different effects on our beliefs and ways of thinking. Obviously, then, the sources are different. Karma originates from the Hindu tradition, first mentioned in the oldest known Hindu text. But like I mentioned earlier, there are many religious Indias, so there are many Hindu sub-areas and differences, too. Once you know that there are over 1000 identifiable gods in the Hindu system of belief, that seems obvious. But this is also true even on just one topic, such as Karma. Over time, different cultures and traditions have taken the concept of karma and have added different details to it, so, the law of karma ranges depending on geographical area. To the contrary, the principle of measured giving and receiving, sowing and reaping is a biblical concept found all throughout the Holy Scriptures. “Do not be deceived:. whatever one sows, that will he also reap. For the one who sows to his own flesh will from the flesh reap corruption, but the one who sows to the Spirit will from the Spirit reap eternal life.” Galatians 6:7-9. Now let’s dig a little deeper. And as we do, we find that Karma, from the basis of its foundation, is something that speaks against what we learn from the Bible. In the principle of karma, the good or bad things that a person does will impact them both now and in their next life. There is the belief that if we do certain things through goodwill, acts of charity, and our personal service to mankind, we can store up goodness for ourselves. Karma makes us believe that if good (or bad) things happen to us, we deserve it because of something that we've done either in this life or a past one. “It is the same for all, since the same event happens to the righteous and the wicked, to the good and the evil, to the clean and the unclean, to him who sacrificed and him who does not sacrifice…,” Ecclesiastes 9:2. Because both good and bad happen to believers and non-believers alike, faith in Christ for an eternal hope is the major dividing line between karma and sowing and reaping. Karma teaches that there are multiple lives (reincarnations), and thus, multiple chances to do good, atoning for the bad that has been done. You are not helping yourselves or others if you speak Karma over our lives; you are deluding yourself and providing a false blessing, saying that we can earn our way into a good or bad life. Why? Because you are on your own to accomplish it! Faith in Christ, and following the measure of giving our lives to HIM, and sowing into HIM, means liberty from such a system of succeeding or failing based on my own actions. This is GOOD NEWS: with the concepts of measured giving and receiving, and sowing and reaping, we see that Jesus Christ did the work for us. By His one-time Incarnation, He then went on and paid our price to enter into eternity with him in heaven on the cross. There is nothing more that we need to do other than live a faithful life. With great help from Britnee Bradshaw at her blog, On The Way Up. The former is found in Matthew’s Gospel; the latter is found in Luke’s Gospel, at Chapter 6, verses 17-26. For instance, in both, Jesus said, “Blessed are the poor in Spirit,” etc., where you can hear Jesus teaching on both the spiritual and the physical nature of being poor. I commend them to you to organize your life around them. Both have been lifted up as cardinal virtues of life. And you can’t go wrong with following Jesus on these. Don’t fail to note that before Jesus started his sermon on these virtues and cautions, he healed all who came to him that day, including exorcising demons. It is very important to note that Jesus did not expect that his ministry as Savior could be all that it was supposed to be if only in preaching. God’s power flowed through him for setting people free from physical, psychological, and spiritual problems. This was the precursor to his teaching and preaching. He does want to heal you. So here, though, is another matter that is so important to us, as well. It shows itself in Sunday’s gospel, even if indirectly. It is the matter of being able to TRUST someone. The way it shows itself is in the timeframe of Jesus’ ministry to this point. This Sermon at the Level Place is, among other things, the first time that Jesus has taught since he chose who among his disciples would be those identified as “Apostles.” An “Apostle”, to figure out why Jesus would use that designation at all, is simply used to identify a person who has been tasked with being the messenger of the one who called. With this identification comes the responsibility to share the message accurately and faithfully. You can see it either in the use of the Greek word “apostolos” (so now you know where that English word Apostle came from! ), or in the Hebrew word of the same meaning “shalluach”, or sometimes, “shallah.” (probably better to use Apostle; if it were the 12 Shallahs, it might sound like 1950’s doo-wop bands!) Anyway, given this new designation and authority, it is right to consider this first teaching of Jesus with his new apostles as very important in their own learning and formation process. But here is our reflection question, “How long does it take to build trust in someone else before you “promote” them or identify them as someone you can trust with your very words and your very dreams and hopes and, for Jesus, his very mission? The timeline for moving from Disciple – or one who follows and is being taught – to being designated as Apostle is not very long. In Luke, it only takes One Chapter to get from calling disciples until the night Jesus spent in prayer and then announced the twelve the next day. That’s an unfair way of calculating, though. However, even the best of considered calculations mean a period of three months to a year. That’s fast for such trust into promotion. Would you trust someone with your very purpose in life after only three months of knowing them? Yes, Jesus had the divine ability to read into men’s hearts and minds. He could tell motives; agendas; fears, loyalties. And even with all of that, he listened to the voice of God the Father in prayer before making such a choice of trust. I would be remiss to not say that even Jesus chose someone who would eventually betray him. That will always have to be taken into consideration when you are deciding to trust in someone. We can, though, make some conclusions for ourselves about the process of coming to trust someone in our lives, like Jesus came to trust those particular twelve, after so little time with them. First, realize – no, make a powerful commitment to yourself – that the decision to trust someone is both of the heart and of the mind. Don’t leave the other out. Second, it will take more time than Jesus took. Yes, there are some gifted people out there who can “read” people accurately. The rest of us, though, have to hear those same thoughts and words by taking the time and opportunity for those people to actually say those things out loud in conversation. Third, like Jesus, you will need to have in your mind just what a trusted person looks like and sounds like, along with certain virtues and life priorities and mission goals. Your discernment and testing will weave in and out of these. We don’t usually think of Jesus in terms of A/V, or of I.T., or other specifications of modern communications. The story coming up on Sunday in our parish gathering of worship, though, might give you a new appreciation for Jesus’ abilities, and gifts, in this area. The reading from the Gospel of Luke on Sunday at All Saints’ is the first several verses of what is known as Chapter 5. 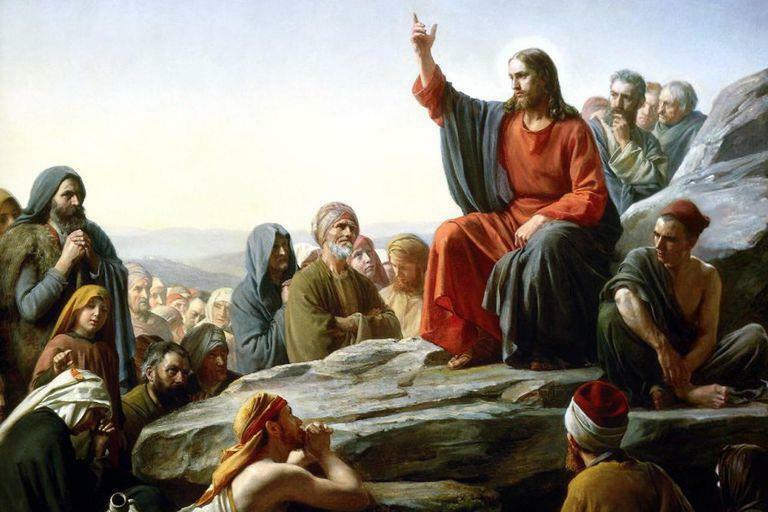 And, actually, if you are going to be specific as a communicator, it must be noted that the Gospel reading includes TWO stories, AND a follow-up “object lesson” from Jesus’ to his closest followers. Here’s the first scene: people were pressing in to hear Jesus teach. He was at the shore of Lake Gennesaret (the Sea of Galilee). The implication is if they kept pressing, he would eventually back step into the water. Here’s the first Master Audio/Visual technique: get out onto the water, and allow the water to reflect the sound of his voice toward the crowd, increasing the volume of his voice at the same time. Basic physics. Brilliant decision. But first he has to have a platform! 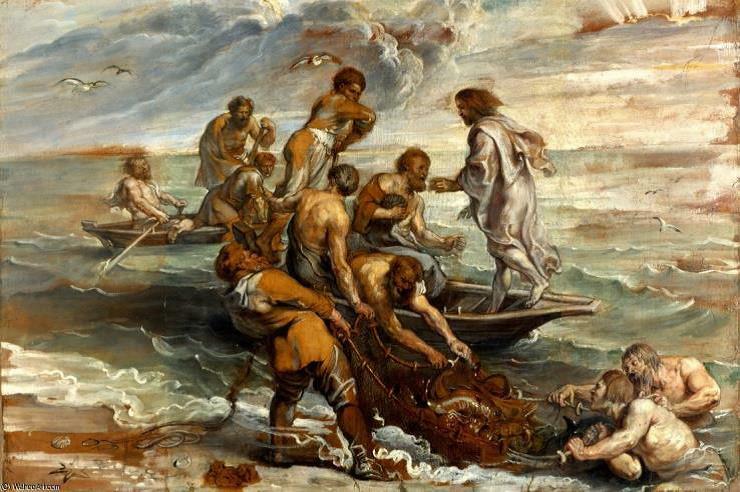 So he steps into one of Peter’s boats and asked him to get him out from the shore a little. Not just “push me out” – that had no guarantee of placement. No, the request was more specific, that Peter would “put out a little from the land,” which implies two things: that Peter was in the boat with him as his A/V assistant, and second, that an anchor was probably used to stay put. Now, I will suggest that this was audio technology that would have been well known at that time. Certainly, for those in the fishing and merchant marine industries, who knew from experience that their voices over water would carry farther and more distinctly. Point: Jesus knew where he was. He was culturally and socio-economically aware, and able to take advantage of his surroundings in order to communicate his Good News. 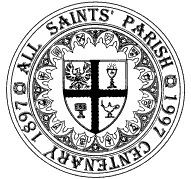 By the way, the first to broadcast a worship service by live radio was an Episcopal congregation in Pittsburgh, PA. The second act of brilliant communicating was after he was finished speaking from the boat, but still out on the water with Peter. Apparently already knowing that Peter had spent all night with his fishing company with no results, he directed Peter to put out the nets on the deep side of the boat. Perhaps this was an attempt to thank Peter for his A/V assistance, being so tired and all. Peter objected, but did what Jesus said. The nets, amazingly, filled in with an enormous amount of fish, enough to start breaking the nets, and for Peter to signal to the other boats to come and assist the harvest. Now this kind of communication, without sonar, was an incredible act of knowing where. This didn’t come from knowing the fishing community or the water. This was Jesus as the Son of God pointing out right at that moment where the fish would be. That is revelation communication. Call it prophecy, or call it a word of knowledge, that kind of communication also has its place in the Good News of Jesus. In fact, it caused Peter to fall to his knees before Jesus in a moment of self-abasement. We would call that an immediate overwhelming sense of humility. It’s always the best thing to show humility – humbleness – in the face of God’s power and love, and that is a great thing for US to communicate. But the communication “skill” for Jesus, brings us to this point: Jesus knows who we are. He knows where we live. He knows what we do. He knows the technology of God to bring God’s extraordinary power into our lives. This is one facet of the communication of God’s love to us, and He CONTINUES to communicate with ALL of His disciples in this same way. How do you think any prayer is ever answered?! And so, the ultimate communication is seen in teaching God’s word, in the display of God’s power, and now showing others how to do the same to bring others to Christ. Christian communication, however, means – by speaking over the water, by revelation of God’s hand and power, by talking about Jesus to others, by radio, by TV, by YouTube! – the art, the gift, the skill, the talent of bringing others to Christ. If you are someone who has yet to find the God they can believe in, then let’s talk about looking at Jesus Christ. Just for this moment of reading. You know, there’s just an enormous amount of things we could talk about in regards to who Jesus is. But this, to be a conversation, also has to be, from your side, answering the question about what may be behind my first sentence. If your question is the same, that is, “Is Jesus someone I can really believe in?”, then we’ll need to talk about what your qualifiers are for “can really believe in.” Correct me if I’m wrong in regard to you – I have found this question is in reference to whether or not God has any idea of what I’m going through in my own life, and, even if He knows somehow the details of my life, is there any sense at all that He’s experienced any of what I’ve experienced? Can God relate to me? We are talking about the nature of a relationship that spells out T-R-U-S-T. And the fear of developing a relationship when trust is broken. And when Trust is broken, and the relationship is thus broken or impaired in some way, then one of the feelings that comes from such is Rejection. There are quite a few other facets of “can really believe in”, such as I want a God who shows no weakness; or, I want a God who proves compassion; or, I want a God who is vulnerable. The bottom line is that Jesus was absolutely REJECTED by his own family and home town people, after He shared some of the realities of His Father in heaven who showed faithful compassion and empathy in the form of HEALING to people who were not considered the People of God at that time. And the People of God did not receive the same ministry from God because, well, they chose not to believe and trust in their own God! So here you are, not having made up your mind and heart about WHO to believe in. But perhaps you’ve heard enough now about Jesus perhaps sharing some of your own life events to keep on reading? As I said, Jesus said to a crowd of people in a Jewish assembly house (a synagogue) that at one time in their history God had bestowed miracles on outsiders who believed. It was a not-so-veiled commentary on the faith Jesus perceived in his home town, Nazareth. Outside this village Jesus had performed amazing miracles, but the unbelief in Nazareth was too thick. Even though they wanted to see a miracle show, they eventually showed themselves to be neither worthy nor ready. “A prophet wasn't honored in his own hometown,” quoted Jesus. The resentment and skepticism that seethed beneath the surface, now erupted in anger and murder. The congregation rose up from their Sabbath synagogue worship intent to kill their homegrown Teacher. They literally threw Jesus out of the building and out of the village. Then, once outside, the crowd led him away to the edge of the mountain that Nazareth is at. Without hearing or trial, and in violation of both Jewish and Roman law, his townspeople intended to kill him by throwing him over a precipice. Is it possible this Jesus knows what you know about personal rejection? But by His divine power and presence overcame the intended results? Is that enough for you to see that this Jesus is someone YOU CAN believe in? Now let me be clear. Life is no fairy tale, and believing in Jesus does not provide a get out of world unfairness card here. But Jesus walking through the crowd -- !! -- should be enough to let you know just Who has the Power in this life, and so Who’s side to be on!! In the story from the Gospel of Luke for Sunday, we hear that Jesus has returned to Nazareth where he grew up. He had been traveling around visiting villages and synagogues ever since his baptism and was returning from his battle with the devil out in the wilderness, now fully empowered by the Holy Spirit. This means, just from reading what Luke wrote, that this visit to his hometown synagogue is his ministry homecoming. “…to bring good news to the poor. He has sent me to proclaim release to the captives and recovery of sight to the blind, to let the oppressed go free, to proclaim the year of the Lord's favor." Why wait until he got to Nazareth to claim this was about himself? Because not only was Jesus a Nazarene, but the Messiah was a Nazarene, and this brings complete fulfillment to that prophecy. You know, this moment reminds me of the public and media-invited announcements made by citizens of our nation that they are running for a particular public office election. It doesn’t seem to matter what the level of that office would be -- local, district, state, regional or national, politicians like to announce from their home towns. Of course, one of the reasons is to make the statement that even though this person has felt within themselves a political ambition, still, this person running for election is no different than any other person: they grew up somewhere specific, they had local friends, they had parents from somewhere. And then just to put a point on this homecoming announcement, they usually like to dress the part of their humble beginnings, like a cowboy hat if you are back in your humble home town of Dallas, TX. Of course, that doesn’t mean that everybody in your small home town is going to vote for you! Familiarity sometimes breeds contempt. Still, announcing from your home town brings attention to not only to the person running for office but also on the town or city. How many little and big towns around the United States proudly display a marker at the city limits that announces “This town is the home town of Franklin Delano Roosevelt (or Dwight Eisenhower, or Abraham Lincoln, or whomever).” Yes, all the way around, that special person makes note of their hometown; it is a special place. So here Jesus makes His announcement of His identity as the Messiah, formally, in the synagogue. Unlike those politicians above, though, the moment is not humanly staged. Jesus did not send a memo forward to the synagogue ruler telling him to hand Jesus the scroll of Isaiah and clearly, it was not so marked for that passage. No, the PR person for Jesus was not a human team. It was the Holy Spirit himself, arranging for that moment. I imagine that no matter what happened before that moment God would have made sure Jesus got that scroll, and that he would read from it in his hometown. This is one more story highlighted in the Sundays after Epiphany of how the identity of Jesus is revealed to the world, to the seekers of Israel, in power, and that the Messianic prophecy fulfilled. No one else is Jesus; no one else is the Messiah. But YOU came from “somewhere,” too. If your identity is already in Christ, have you considered the path of your life, and your spiritual journey to Jesus, and what happened along the way? Can you see how God has been involved to bring you to that special place where you proclaimed him as your Lord? You do this reflection, and I can almost unequivocally guarantee that you will see God’s hand on your life, leading you until you did decide to follow Jesus, and that he’s still leading you. You can’t make those stories up; the realization of God’s desire to lead YOU to such moments of grace and confidence are humbling, and full of grateful thanksgiving. If you have not yet come to believe in Jesus Christ as the Savior of the World, you should know that everyone who has ever reflected on their life, considering where they have been and where they are now in their personal journey, can see that God was already there in their lives leading and guiding them to come to that special moment of public proclamation. The Church notes that as the day of your baptism. He’s been there with you. It’s time to believe in the One, the only One. Let’s make note of a several things before considering what this means for us today. First, there is a miracle. Miracles are events that defy our known ways that the physics of the earth and the universe work. It is not an acceptable scientific or physical truth that a human being can “walk on water.” It is not an acceptable truth that wine can be created instantaneously from water, other than to note that the normal methods of producing wine will include some amount of water in order to bring the fruit to harvestable readiness (somewhere between 2 to 5 gallons out of the soil and air per glass of wine for dry farming, and 12 to 15 gallons for irrigation-based vineyards). These are the common Gospel stories during the season of Sundays after Epiphany, when Jesus is manifested to the world. You can add in feeding 5,000 and also 4,000 people from a basketful of bread and fish. Or commanding a tree to wither, and it does immediately. Or raising someone to life who has been dead for three or more days. Or finding gold coins in a fish’s mouth that Jesus said would be there (I’m pretty sure we’ve all heard stories of things found in fish, like coins, rings, bullets, and more…but to be told to go fish to find a fish that has the coins in its mouth in a specific area, and the first fish has the promised coins – that’s pretty much a miracle)! Second, somebody else got the credit for the wine brought out late to the party, even though no recognition of a miracle is included in that credit. And Jesus said nothing. 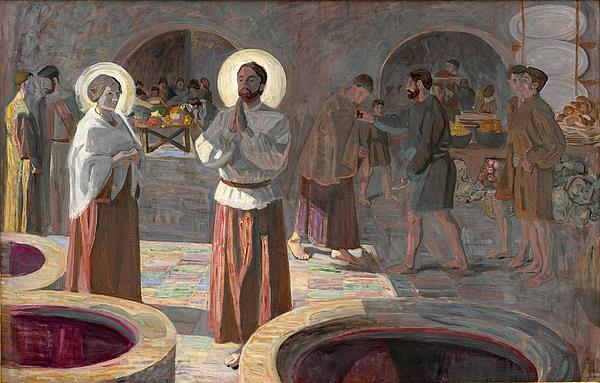 Third, somebody DID witness the miracle – the servants – but they said nothing. Fourth, this is the third of three stories that kick off the season of Epiphany, or the Manifestation of Christ to the World (“the Gentiles”). The first was the world coming to Jesus with the Wise men from other Gentile nations/countries/peoples. The second and third, Jesus’ Baptism and presentation as the Messiah and going forth with the LOVE of God, and the Miracle at Cana of Galilee (this one with water into wine) is the presentation of the POWER of God in the Messiah. My thoughts about this Gospel lesson for you are informed this week by the second reading of Sunday, the Epistle, which is also taken from the New Testament. In that lesson, St. Paul enumerates nine spiritual gifts from the Holy Spirit given deliberately to various members of the Church as they are empowered by the Holy Spirit, such as gifts of healing, and words of prophecy, and speaking in tongues. We’ve seen these regularly in the Body of Christ since the feast of Pentecost, and even before. There’s another one worth mentioning here from Paul that says, to another [is given] the working of miracles. When the steward of the marriage feast thanks the bridegroom for providing more wine, our first thought is, “No, no! JESUS provided the miracle!”, and you’d be right. But when Jesus doesn’t say anything it points to another truth, that Jesus is very willing share the wealth when it comes to miracles, and then provides the power to see it happen. Granted, the steward’s presumption in this story is incorrect. In fact, I’m sure the Bridegroom is just as surprised as the steward! And of course, there are witnesses as to what really happened. But if Jesus is willing to not say anything at this moment to demand proper credit, the room is left open for Jesus to actually and really delegate his miracle making power to others, and let the witnesses see someone else besides Him doing them. Of course, the Power for such is His. But how many times have you heard someone trying to take credit for something somebody else really did?! Happens all the time. Not with Jesus. Not everybody will be given the ability for “working miracles”, in fact, it is a small percentage of church members who will. But whether it is miracles or any other display of God’s Power, it is to be understood as a “sign” and a visible “power”, that is, manifested Glory of God, for this one purpose: that men and women, boys and girls, will BELIEVE in Jesus. Miracles for any other reason, according to this scripture, would be only attention getters for the person working them. And we know from the scriptures, as in the story of Simon the Magician in the Book of the Acts of the Apostles, some people will pay a hefty sum of money to have control of such an ability for their own selfish purposes. With that in mind, this story, along with Paul’s letter about spiritual gifts, lets us begin to realize that God wants to do very, very powerful things THROUGH US, and our job is to say “YES!”, and ask for the power to make it so. God can change our understanding of physical reality; He wants us to be able to do the same. I have imagined the same after Jesus was baptized in the River Jordan, where folks who witnessed it would tell others about what happened, and the signs from heaven that accompanied the baptism. There were a certain number of people there, lots of people, but even then, I bet even not all those people realized what was taking place. Those people may have seen some of the things, like a dove, or heard a voice from the clouds, but they may have been blocked by the crowds from seeing the actual baptism. Can you imagine, “Man, Yakob, you should have seen it. It looked like the very heavens themselves opened up, and then this dove came down, and then there was this voice, and John was there in the river with this other guy…” And Yakob replies, “Oh, that’s nice.” Hmph. I guess you had to be there. The main thing is that Jesus was baptized in fulfillment of all things. So, the baptism work for the day had been accomplished. And in Luke’s account Jesus is baptized as the crowning baptism of the day, at which time the signs took place. There is no confusion here about one sign or the other being displayed or manifested mistakenly for someone else. 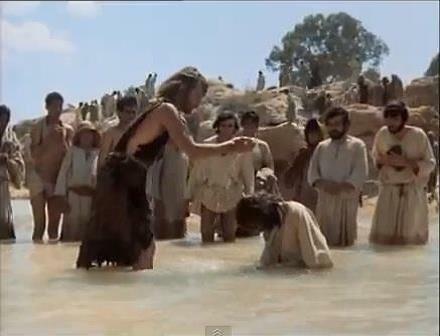 That might have been the case if Jesus had been baptized as one among many in the crowd. But there was no mistake here. It is Jesus, the Son of God, to whom the Father in heaven spoke those words over this particular One. Upon Him is the line of David to be fulfilled in an eternal kingship. Do you need to wait for someone to share this story with you, so that you can share in that eternal life and kingship? No. You’ve just read it. You’ve heard me share it. You don’t have to wait any longer. So, now what do you do with this information and story? Well, it is not necessary for you to feign the same response as you might know someone else had. But it is necessary for you, if you wish eternal life, to hear the voice of both John the Baptist, and Jesus Christ, the Son of God, and accept Jesus for the person that God the Father said He was “My beloved Son”, and John said He was, “but one who is more powerful than I is coming (that is, the Messiah! ); I am not worthy to untie the thong of his sandals. He will baptize you with the Holy Spirit and fire." And you will have your own story to tell about God’s presence in you and through you, which you will want to tell. And you will be able to hold onto that story and be proud of it, and be excited about it, and tell it over and over, hoping others will hear and receive and turn to Christ. This Sunday we celebrate a day that doesn’t always fall on a Sunday: Epiphany or The Epiphany. You see, there is a connection between Christmas and Epiphany, and that connection is “The Twelve Days of Christmas.” So, since Christmas is always December 25th, Epiphany will always be January 6! But that doesn’t explain the connection besides there being 12 days. 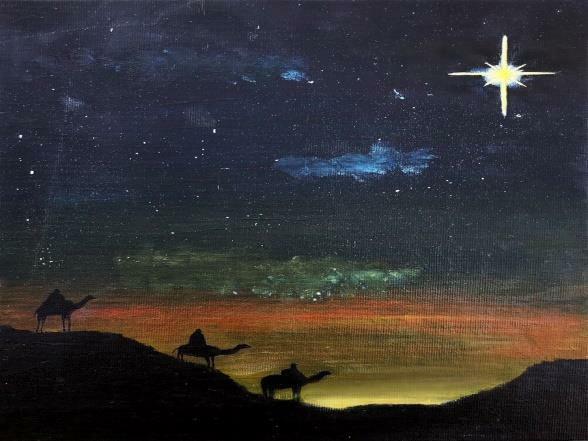 The connection is that Epiphany is the day that we celebrate the Wisemen finally arriving at Bethlehem. And then we say goodbye to the Story of the Birth of Christ until next year. Twelve days just happens to be the time in between these two days of celebration. And there’s a wonderful song that has been sung for centuries that we all know by heart. An “epiphany” is an “appearance.” Sometimes the word “manifestation” is used to translate epiphany. “Look! Here he comes!” is one of the phrases we use to point to the moments in the Bible when Jesus “shows up.” It doesn’t have to mean “show stopping”, but that is one way to relate such a thing in our day. When the Beatles iconically appeared in the door of their jet airplane on their first trip to the USA, there was an immediate cry (and screaming and tears!) as young people (mainly) said in their own way, “Look! There they are!” In the same genre, when a famous artist “appears” on stage at somebody else’s concert, there is usually cheers and applause from the audience. The surprise appearance surely could have been “staged”, but to the crowd it was an epiphany. There are so many “appearances” in the story of Jesus’ birth, with rising stars, splendorous lights, and mysteries revealed, it is easy to say that these things are epiphanies. And the greatest is the face of the child born on Christmas day: this is the appearance – the epiphany – of God to be with us. Well, now, wait a minute, you might say….is this a new celebration called Epiphany, or isn’t that Christmas you are talking about? And the answer is Yes! It would appear from ancient days of the Church that “Epiphany” was the first of the celebrations of Christ’s life, after the Resurrection, of course, and the Coming of the Holy Spirit at Pentecost. And yet there is more. There is the epiphany of the God incarnate here to us;, and then there is the epiphany of this Christ to the rest of the World, which is so much of the meaning ascribed to the visitation of foreign wisemen who were not Jews; and then, there is the epiphany of Jesus at the River Jordan and the voice from heaven along with the Holy Spirit coming down on him at that moment in the form of a dove. The BIG picture of the feast of Epiphany, and the season of Sundays called by the same name that follow, is the appearance of Jesus Christ to the World in these various and powerful ways! Eventually the nativity of the Christ would have its own day, and so would the Baptism of Jesus, always celebrated the first Sunday after January 6. And that leaves January 6 to celebrate the arrival of the wisemen with their gifts to the scene of the Jesus’ birth, still there in Bethlehem. So now let’s look at the lessons for Sunday, the Epiphany, January 6. I am using a lot of material here from Dr. Scott Hahn as an introduction to his biblical teaching. We hope to have a weekly study started in a couple of weeks using his bible resource material and study questions. Herod, in today’s Gospel, asks the chief priests and scribes where the Messiah is to be born. The answer Matthew in his gospel puts on their lips says much more, combining two strands of Old Testament promise—one revealing the Messiah to be from the line of David (see 2 Samuel 2:5), the other predicting “a ruler of Israel” who will “shepherd his flock” and whose “greatness shall reach to the ends of the earth” (see Micah 5:1–3). Those promises of Israel’s king ruling the nations resound also in today’s Psalm. The psalm celebrates David’s son, Solomon. His kingdom, we sing, will stretch “to the ends of the earth,” and the world’s kings will pay Him homage. That’s the scene too in our First Reading, spoken 6oo years before Jesus’ birth, as nations stream from the East, bearing “gold and frankincense” for Israel’s king. Laden with gold and spices, their journey evokes those made to Solomon by the Queen of Sheba and the “kings of the earth” (see 1 Kings 10:2, 25; 2 Chronicles 9:24). Interestingly, the only other places where frankincense and myrrh are mentioned together are in songs about Solomon (see Song of Songs 3:6; 4:6, 14). One greater than Solomon is here (see Luke 11:31). He has come to reveal that all peoples are “co-heirs” of the royal family of Israel, as today’s Epistle teaches. His manifestation forces us to choose: will we follow the signs that lead to Him as the wise Magi did? Or will we be like those priests and scribes who let God’s words of promise become dead letters on an ancient page? The answer, of course, is yours to make. As has been said on that popular art form, “bumper stickers”, Wise Men Still Seek Him. May you find Him as He has appeared!